Data works and calls but no text. Please help. Called Care and had them put on the block sms feature on then reboot then take it off and reboot. boom it worked. Have you try other messager? Have you tried downloading this app? It's Google's carrier services plug-in. Maybe it will help? Now text and MMS are broken on Verizon so I will be sending this phone back. Why the heck is this and what does it do? Sorry I should have asked a better question. What I'm try to figure out is this... I do not have this app on my TMobile Note8, I'm wondering if there would be any benefit to installing it. For example, I keep reading everywhere that TMobile supports RCS, however we have never actually noticed any of those features working on either mine or my wife's Note8, could this be why? I think we (TMO customers) have to wait until they switch over to the Universal Profile that Google introduced last year(?). Right now TMO is using it's own proprietary flavor of RCS. Which very few OEMs support. But even THAT doesn't work for my wife and I. I don't see any "typing notifications" etc.. even though everything is turned on and Samsung supports it. Yeah I have no idea. Especially since it's a Samsung (not a fan). 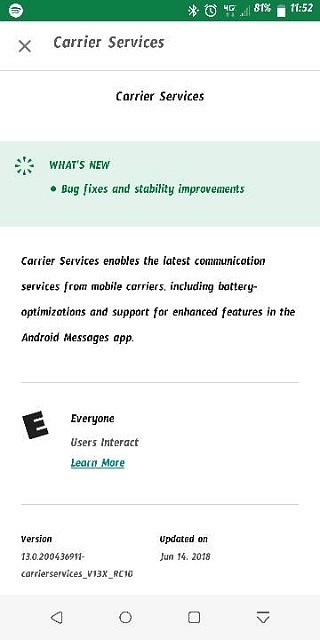 Have you read this( https://support.t-mobile.com/docs/DOC-30170 ) Maybe that'll help you. My wife had the GS8 and now the GS9+ and both had those features. Both were T-Mobile branded. My daughter has an unlocked S8 and had none of those features. It's bizarre that it wouldn't be consistently installed in the base OS. But I loaded the T-Mobile version of the GS8 Oreo update and now my daughter has those RCS features. Multiple attachments select not available on email app.